Features: Wireless outdoor temperature (¡ãF or ¡ãC). Monitors indoor temperature (¡ãF or ¡ãC). 12 Moon phases. Atomic time and date with manual setting. Automatically updates for Daylight Saving Time (on/off option). 12/24 hour time display. Perpetual calendar. Time zone setting. Time alarm with snooze. 4 languages to choose from: English, French, German, Spanish. Wall hanging or free standing. 11 1/2 " wide x 7 3/4" Tall. Time digits 2" tall. Specifications: Wireless outdoor temperature range: -39.8¡ãF to 139.8 ¡ãF (-39.8¡ãC to 59.8 ¡ãC). Indoor temperature range: 14.1 ¡ãF to 103.8 ¡ãF (-9.8¡ãC to 39.8 ¡ãC). Moon phase: 12 phases. Transmission range: Up to 330 Feet. Transmission frequency: 915 MHz. * Power Requirements: Clock: 2 "AA" Alkaline batteries. Wireless sensor: 2 "AA" Alkaline batteries. When is a clock not just a clock? When it provides so much more than just the time: temperature, phase of the moon, and accuracy within one second per year, for example. 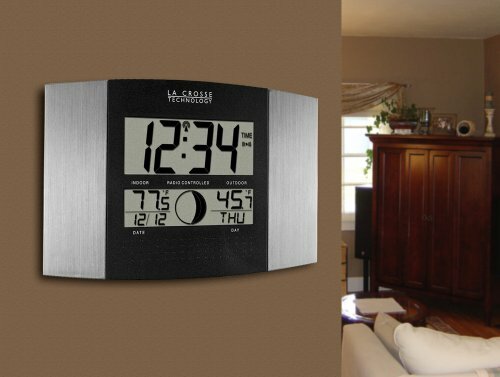 This handsome wall clock, with its dual LCD screens and black-accented brushed aluminum finish, is an example of household life being enhanced by science. The WS-8117U-AL can hang on the wall or stand freely, with a built-in, fold-out stand. Radio-controlled time (to the hour, minute, and second) and date are prominently displayed, along with indoor and outdoor temperatures measured in either Fahrenheit or Celsius. The day of the week can be displayed in English, French, Spanish or German. Time can be displayed in 12- or 24-hour modes, and time zones from Greenwich Mean Time to -12 GMT can be selected, with three-letter identifications for US time zones. An alarm feature is useful as a timer, and, if the clock happens to hang or stand near a bed (or a couch that's used for napping), a snooze feature allows for gradual wake-up. Moon phase shows in twelve increments, from new moon, through gibbous and crescent phases (waxing and waning), to quarter and finally full moon. Received this clock in the afternoon one day and the next morning had an atomic synchronized time, plus accurate outdoor temperature. The time was perfect as it agreed to the second with my Casio atomic watch and another atomic clock in another room. The outdoor temperature worked well also and agreed with an outdoor thermometer nearby. And of course I also had the moon phase display, which doesn't seem nearly as confusing to me as some others seem to find it. A thought for those who want to place it near a source of electronic interference: as the clock without updating is a quartz movement and still keeps time to within a half second or so per day, place it in a "clean" spot overnight to get the time perfect. Then move it wherever you want for a week or so, after which time it will still be only 3-4 seconds off at worst. Move it to a clean spot again for a night, and repeat the cycle. I couldn't be happier with this clock. It does just what it's supposed to do and does it perfectly. It's really neat to have perfect time all the time. As expected, it's time is accurate and I like the way the outside temperature is transmitted through 2 wallboard and 1 cement walls. I purchased this clock about one month ago. It performs exactly as specified. I was particularily interested in the clock's ability to be set to UTC and 24 hour mode. It's a little early to give a definitive critique. Perhaps I can update this review a year from now. Others who have purchased this clock seem very satisfied with it. So far, I am completely satisfied with my clock too. It's been about a month since I bought this. I never would have imagined how much you can depend on something like this. After 5 years, the unit for the outside temperature went out. It wasn't the batteries, but we thought, "Oh, we don't need the outside temperature all that much." We love the big numbers that I can read from the next room. But we soon realized how much we depended on the outside temperature reading! When we exercise, when we walk the dogs, well, whenever we go anywhere. Check the temp, see what to wear. We are getting a new one now, same clock, because we love it!!! We would definitely recommend this clock for anyone! right up to the minute temperature display. be shielded from the elements. and have always been pleased with their products. The clock is very nice, but very hard to see at night. Am I doing something wrong, does it illuminate at night?